Hugh Dugan is named Seton Hall School of Diplomacy’s first Director of UN Engagement. This appointment makes Seton Hall School of Diplomacy and International Relations the most UN connected school. 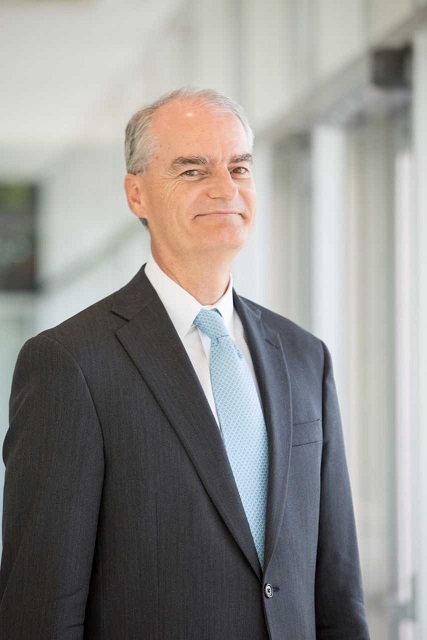 Hugh Dugan is a Sharkey Distinguished Visiting Scholar and Fellow, Seton Hall University School of Diplomacy and International Relations since 2015. He served in the US Diplomatic Corps from 1983 to mid 2015 as senior adviser to eleven US Permanent Representatives to the United Nations and as US Delegate to the United Nations. Since 1989 he worked among the UN’s 193 Member States and its Secretariat In New York and Geneva. He managed a broad range of matters enabling effective, strategic US participation at the United Nations. This lead to his collaboration with senior US Congressional figures, together spearheading UN institutional and managerial modernization leading to historic Helms-Biden legislation releasing the payment of $1 billion in US arrears to the UN budget. Based on this, and in the wake of 9/11, Mr. Dugan was recruited and served as senior fellow and advisor to US Senator Michael B. Enzi (R-WY), Ranking Member on the US Senate Foreign Relations Committee’s Subcommittee on International Operations and Terrorism. Mr. Dugan served as the lead negotiator on many US Delegations to the UN, such as to the UN’s Peacebuilding Commission, Economic and Social Council, and Committee on Non­-Governmental Organizations. He coordinated the US Delegation to many sessions of the General Assembly and of the Economic and Social Council and served as the US senior expert for elections to UN membership bodies. Through expert assessment and management of international political dynamics as played out at the United Nations, Mr. Dugan initiated and negotiated many significant UN agreements, such as normative, technical, and operational items within the evolution of North-­South relations. He championed UN measures in support of the private sector’s role in corporate social responsibility, advocated for a new partnership for African development, advised on the selection of the Secretary-General, and advanced the UN’s program of sport for development and peace, among many other issues. Prior to his UN posting, Mr. Dugan served in the American Embassy in Mexico City (on immigration and economic matters); the American Consulate General in Bermuda (including oversight of three major local US military facilities); and the US Department of State’s Bureau for Economic and Business Affairs in Washington (working on Congressional trade legislation and diplomatic outreach to the business community). The US Department of State honored his performance with five commendations during his thirty-­two year career. Mr. Dugan currently serves as Thomas J. and Ruth Sharkey Visiting Scholar on UN Studies at the School of Diplomacy and International Relations, Seton Hall University (USA) where he is a professor on UN Reform and UN Security Council Issues. He is a contributor on FOX News and China’s CCTV on international topics. A frequent lecturer to university groups Mr. Dugan is sought out as an opinion leader on the practice of diplomacy and on matters related to the Olympic Movement. Mr. Dugan has held civic leadership roles in activities related to youth, sports, culture, and foreign affairs. The International Olympic Committee honored him with its Centenary Medal in 1994 for his role in reviving the Olympic Truce for the modern era. He went on to create the Truce Foundation of the USA that recognizes leadership within the Olympic Movement. Mr. Dugan served on the board of the Academic Council of the United Nations System comprised of the world’s leading scholars on the United Nations and global governance. He served as chair of the world’s largest YMCA branch (New York City); Vice president and treasurer of SOS Children’s Villages (USA), the world’s largest youth services non­profit organization; Treasurer of the Dance Perspectives Foundation producing the first Illustrated Encyclopedia of Dance (Oxford University Press); and President of the Fletcher School Alumni Associations of Washington and of New York City. He supports the Breast Cancer Research Foundation, Phyt Cares (serving disadvantaged youth in New York City), and the Bermuda Institute of Ocean Sciences. He is a member of the Equestrian Order of the Knights of the Holy Sepulchre of Jerusalem, of the Metropolitan Club (New York), and Tuckers Point Club (Bermuda). Mr. Dugan earned degrees and honors from the School of Foreign Service at Georgetown University (BSFS), the Fletcher School of Law and Diplomacy (MALD) as S. Pinkney Tuck Fellow, and the Wharton School of Business (MBA) as a State Department Fellow; and holds certificates from the International Olympic Academy (Olympia, Greece). He has a fluency in Spanish. As a student he interned on Capitol Hill (DC), the House of Commons (London), the Government of American Samoa (Pago Pago), and the Embassy of Saudi Arabia (DC). Hugh Dugan founded the Truce Foundation of the USA. The International Olympic Committee awarded him its Centenary Medal in 1994 for his role in reviving the ancient Olympic Truce for the modern era through the United Nations General Assembly. Mr. Dugan is married to Ute Dugan, MD, PhD, at Bristol-Myers Squibb. Victoria (14) plays basketball at the Lawrenceville School and Evelyn (13) was a Food Network “Chopped Junior” champion in 2016. They reside in Princeton, NJ, and Southampton, NY. More about Mr. Hugh Dugan here.